Claire Burke Wax Melts are an easy, flameless way to enjoy your favorite fragrance. 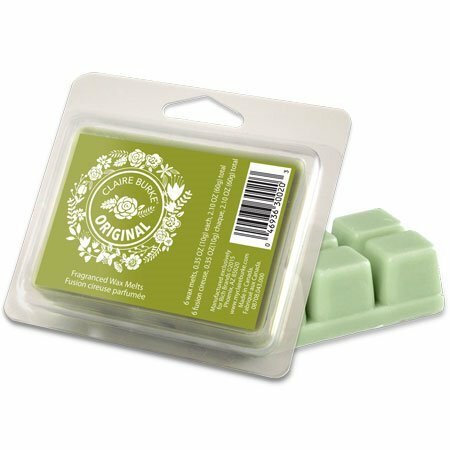 A blend of high quality refined paraffin and soy waxes maximizes the fragrance impact as they warm and melt. Simply pop out a cube from the six section brick and melt in your favorite warming device. 2.10 oz per package. Each brick fragrances up to 60 hours. Also offered here: a selection of Wax Warmers in several styles to complement your home decor. Claire Burke Wax Melts are available in Original, Applejack & Peel, The Sea, Citron Verbena, Wild Cotton and Christmas Memories. Claire Burke Wax Melts can be used with your favorite melting device.